Comfortable spacious waterfront ranch home with lower level on beautiful Lake Keowee. Home is situated at the end of cul-de-sac in a quite neighborhood in the Crooked Creek section. 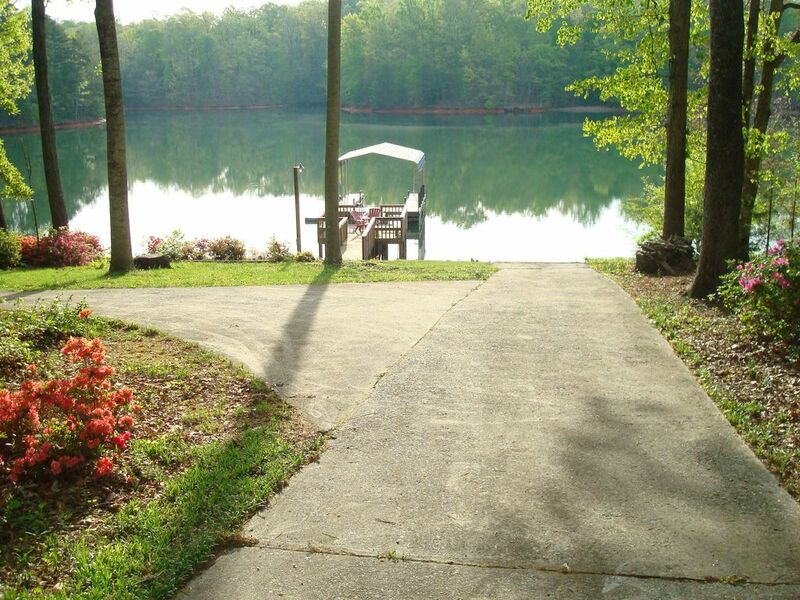 Home has a private boat ramp with dock and ample parking space for boat trailer. Boat dock has jet ski slip. Home is surrounded by tall and mature hardwoods with large garden areas. Home is 3,000 square-foot with many outdoor porch/patio areas. The large fully equipped kitchen has ample seating for 10 people for dining at table and island. Living room has queen sofa bed and a beautiful view of the lake. Home has screened porch off the living room with patio table and another seating for 10. Master bedroom has queen bed with view of the lake. Master bedroom has 1/2 bath with laundry room. Second bedroom has one double bed and a queen size bed. All bedrooms have large closets. Third bedroom is lake front on lower level. It has a queen bed and full bath. Flat screen televisions throughout including bedrooms. Lower level has another living area with beautiful lake view. Lower level has separate dining area and another open air lake front porch with picnic table. This home is great for family vacations and friendly gatherings. Perfect for Clemson football weekends. Mature hardwood trees deliver spectacular Autumn colors. Perfect home for our family and weekat the lake. House had everything we needed and was very comfortable. We hope to return next year! Nice folks here! Please come again. Great location and communication with owner! Very convenient to have to boat landing on the property. Owner is very responsive. What a fantastic experience for our daughter's graduation! This was our first stay at this property. The owner was fantastic to work with and very quick to respond to any questions. The house was located at the end of a quiet street with a wonderful view of the lake. We enjoyed the great screened in porch to relax and take in the sounds of nature. The property was very well maintained and had more than enough space for all of us. The downstairs has a separate living area which is wonderful for 2 families or teenagers so they have their privacy. Although we did not use the boat ramp, as boaters we did check it out. It is in great shape and would be an ideal location for launching a boat so you would not need a busy marina. I would definitely stay here again!! Thank you for the kind review and it was a pleasure to have you and your family. Please come again any time. We take a lot of pride in keeping a comfortable and relaxing place for your vacation experience. We just came home from the most peaceful vacation we have had in years! This house met our needs perfectly and the location was excellent. The kitchen was well equipped and the house is spacious. We really enjoyed having our breakfast on the screened porch each morning. The boat ramp made things so easy for us. I would definitely recommend this house to anyone wanting to get away and relax. The owner is very prompt in responding to emails, etc. We loved this place! boat was huge as we took our boat for a day trip to Lake Jocassee. We will definitely be coming again! Thanks for sharing your home with us. $250.00 refundable security deposit required $150.00 departure cleaning fee Pay with PayPal or by check. Check with the owner.